My wife, well, she has a split food personality. In order to explain the multiple cooking personalities that my wife often displays, I’ll need to break out some sports metaphors – auto racing, in fact. I hope she doesn’t think I mean that she has a disorder, like a multiple personality disorder. And why use sports metaphors? Who cares…an artist uses the best tool available to explain the world! Sorry about that digression into self doubt. When I italicize stuff that means I’m talking to myself. Let me state clearly that she is a good cook and by invoking references to auto racing I’m only trying to explain differences in a few cooking styles that my wife appears to have mastered. I’m not evaluating whether a certain style of cooking is better or worse, because it’s all good. So let’s put it this way. Gail loves cooking up a NASCAR meal, like the ribs and mac and cheese last month. The NASCAR meal usually involves red meat and a side with a creamy starch, but I swear, it never involves a fat guy named Jimmy. Veggies and fruits are not very prevalent and the meal is usually served on one plate and consumed rather quickly. That is not to say it doesn’t take time to prepare, it’s just that the actual consuming of the meal is often done in front of the TV or from the back of a truck, making a one-plater a smart idea. God she’s smart, if I had half her brain I would probably be president, or at least an alderman. But the meal pictured above is the start of something that is all Formula 1 baby. The F1 meal takes hours and is an event in and of itself. That’s why it’s going to take three posts to get through this meal because it’s as diverse as the countries and courses that F1 races on. It will include three distinct sittings and a guest pastry chef. The meal is more of the focus when in F1 mode and I think Gail enjoys it a little more. So that tasty platter pictured above is the appetizer…or do you say hors d’oeuvres…or maybe antipasti platter? Let’s call it the first sitting. 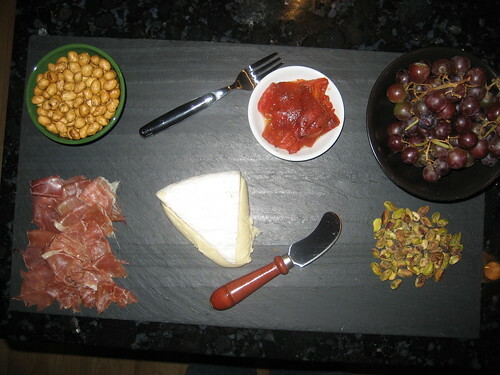 Starting in the upper left and going clockwise, we have Wolfie’s traditional coated nuts, homemade roasted red pepper in olive oil and balsamic vinegar, red grapes, shelled pistachio nuts, triple cream brie, and prosciutto ham. She serves it up on a slate platter with a basket full of crusty bread. It was shared by four people and we knocked the whole thing off in about an hour. This first sitting is usually in the family room and it just kind of eases you into the meal. Nobody gets that full and its very casual and relaxed. I rarely attack this food with the same vigor that I attack the main dish with because it’s a community plate and I don’t want anyone to feel like they might lose a limb if we are competing for the last pistachio or something. My favorite food combination in this situation is to take a piece of bread, spread a generous portion of brie on it, layer on a roasted red pepper, and then top it with a slice of prosciutto. It makes a very, tasty, mini, open-faced sandwich. I will toss down a few nuts, grapes, and pistachios separately just to get primed for the main dish. I love putting my feet up on the coffee table, having a beer or a glass of wine, grabbing a little chow, and talking about the topics of the day. Damn, I wish we could just talk about golf or college football…maybe even toss in a little discussion on Britney’s latest adventures. Stick around, we are only about one third done. Come back soon. Posted in food on 2007/02/16 by John.